Of course, not all tools are the same size. Bosch solves this problem by offering pre-made hard inserts molded to fit various power tools. So to make use of the system, you’ll need LBOXXen and inserts configured for your specific tools. The LBOXX comes in four height variants. Think of them like rack units. The LBOXX-1 is a “1U” case, the LBOXX-2 is twice as tall, the LBOXX-3 is three times as tall, and (you guessed it) the -4 is four times taller than the -1. All four versions offer top, front, and side handles, giving you three different ways to carry them — or many different ways to grab, pull, position, or carry the “brick” of multiple boxes latched together via integrated locking clips. Pricing runs from $50 (the -1) to $60 (the -4), and ~$50 gets you the LBOXX-1A, which is a standard LBOXX-1 with a 13-piece insert set designed for holding small parts or components. The trick will be getting inserts for your tools. 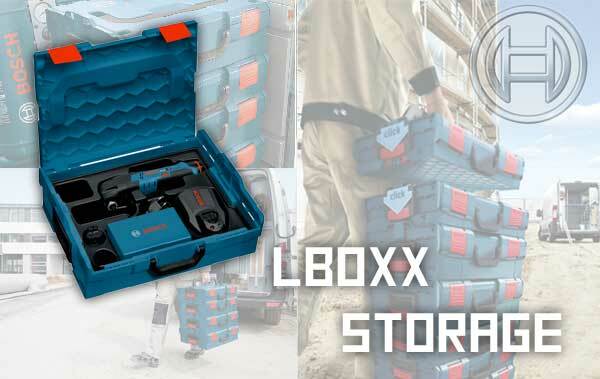 A little browsing on the Bosch site convinced us that Bosch’s plan is to sell tools in LBOXX kits (standard kits, but with an appropriately-sized LBOXX complete with inserts) and/or bare tools with insert. We didn’t see any option to buy inserts alone for tools you already own, though we might simply not have found them. So, like always with storage systems, you’re going to have to evaluate how these will work for you. At worst, it looks like just buying Bosch tools will get you into the LBOXX systems via the new kits, which is an improvement over standard incompatible-with-each-other blow-mold cases. At best, they could offer a clean way to carry and store a group of power tools specific to the job at hand. When the plastic closures on my hard shell cases finally give up the ghost, I make a nice hardwood, fitted case for my tools. And you can make them to hold more brads, batteries, an extra cord, etc. They wear like iron, stack nicely and you can label them anyway you want to identify which tool is which. Those crummy soft bag things are a joke. I personally find bags to be the best way to keep my tools and accessories organized and ready to go mobile. I try to stay within a specific size range, being sure they fit the shelves in my truck. Most of my work is residential/interior so I need to be careful about anything hard enough to damage or mar cabinets, furniture, floors, etc. I also like to use canvas rolls for hand tools, for the same reasons. I do use hard plastic carriers for fasteners and other hardware. Soft bags to keep drill, impact driver, bits, together. Hard case for my circ saw. It will also hold four spare blades. I made custom cases for tools I only use inside my shop like the router, jigsaw, and sanders. Our recent purchase of a copuple of new Bosch JS572 jig saws came with L-Boxxes – which look OK – but time will tell about how they hold up. What should help us is that we compartmentalize our Knaack boxes to fit our toolboxes/bags and larger loose tools. I personally still miss the passing of the metal cases that came with tools back in the ’60’s through “90’s – but have to admit they were probably bundled into a higher tool price. Our 2 old Bosch 1584VS jig saws (now converted to coping (Collins Coping Foot)use exclusively – are still in their blue steel cases which came with them in 1995. These boxes even have steel insert boxes to hold blades etc. Festool invented this idea (I think) and I know their cases hold up well and are considered useful by lots of woodworkers (me included). In shops with lots of Festool equipment the tools are often stored in the cases, as opposed to the cases being stacked in a pretty tower against a wall. They function well. I’ve seen the Bosch cases at stores in Europe and they look to be of the same caliber. If they stack together and are half-way durable they’re a good thing. I presume Bosch will start offering other products that work with the Lboxx’es like shelving units, casters, etc. which is a good thing. Festool has a line of just cases that can be purchased for most any tool. I used to work with a guy who built custom wood cases for every power and hand tool he owned. All with handles for easy carrying, except – some of those cases were heavier than the tools inside. A lot of extra weight to tote around. Then, I ended up at his house and he showed me all the tools and custom cases his father had. He had them carefully stored and loved showing them off. They were pretty amazing! Constructed and built line handcrafted furniture. No power tools in his dad’s collection. All the tools had that patina of long use. I have metal rack shelving in my garage for storing parts for my project car in large bins, so when I need to store odd-shaped tools that I don’t use that often I went with smaller bins stacked on an additional shelf. Power and air tools that I use often are in the bottom drawer of my toolbox, and I’ve used felt-covered blocks of wood to arrange and organize them. My wife thinks I have a bin addiction a-la OCD. She may have a point. Just as a point of reference Bosch’s system is made by Sortimo and they have a number of different lines of boxes. The L-Boxx line has a 4 wheel dolly and 2 wheel cart for transport options. Festool’s Systainers are made by Tanos. I recently bought 2 of the LBOXX-2’s at a local tool store here in So Call for less than $30.00 each. They came with foam that was pre-slit in 1/4″ squares. Allowing for easy customization. they not “working as a tool rack”,your 1u formula is completly untrue,not all of them coming with the side handles…. i think you have seen one somewhere and you make the rest of you article up! whats the point writing about things which you havnt a clue? My understanding is that the Bosch iBoxx line is a direct Sortimo rebranding, and the LBOXX is Bosch’s take on the Sortimo. if you read the amazon reviews, people say that stuff falls out of the LBOXX containers when you turn them(but not iBOXX).